« Have a Blessed Christmas & a healthy, peaceful 2017!!!! Kattenmanieren #6-2016: Walk on the Wild Side. 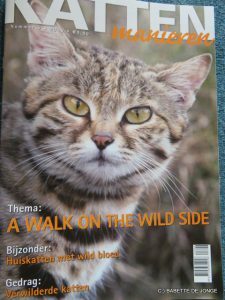 As announced before, in the new issue of the Dutch domestic cats magazine Kattenmanieren, again a fabulous article on WCW and all wild catspecies. In this issue an extra touch of the wild, so also extra pages dedicated to the wild relatives of the domestic cats. Mention of all species, and of course focus on the WCW species African wildcats, Black-footed Cats, Caracals, Cheetahs, Leopards and Servals, with page filling picture of one of the ambassadors of each species. Black-footed cat Diva starring on the cover. Janine Verschure (editor), info@kattenmanieren.nu. After payment for the magazine and postage she will send you the ordered copy.